It is not just missing responses that is worrying about the now withdrawn TfL Oxford Street Consultation reports, it is also the misinterpretation of stakeholder responses. Take for example the 10 page response from “Paddington Residents Active Concern on Transport”. Just one example of misrepresenting the responses received. “Interim consultation reports” or Incomplete consultation reports? If you would like to read what TfL are now calling “interim” consultation reports which have now been withdrawn as they were found to be missing responses. You can read these incomplete withdrawn reports here. We found that there are also a few errors in them! 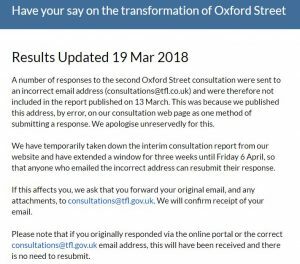 The long awaited results of the second Oxford Street consultation which closed over 2 months ago have finally been released. It is now apparent why it has taken so long, because within it is one big, unmissable message for the Mayor – the West End Does Not Want It. 61% of Westminster residents voted against, with a further 16% having unanswered concerns. 68% of businesses voted against with 13% concerned. Indeed only 23% of residents supported it. Businesses were even more damning, giving it a mere 19% support. 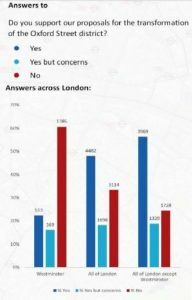 Even nationally TfL could only muster 48% for pedestrianisation, with 52% against or having concerns. 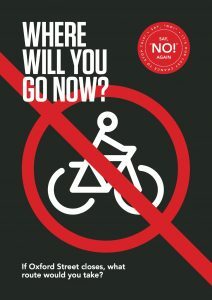 And this in the face of concerted and co-ordinated campaigning from various pro-pedestrianisation groups, a protracted and one sided media campaign from TfL, including public adverts on 11 of London’s radio stations and the 3 major London papers, posters and roadshows, all offering only the pro-pedestrianisation argument. These figures torpedo any mandate to proceed with the present scheme. The question has been asked, and the answer is clear: the scheme in its present form must not go ahead. This is a warning to the Mayor and WCC to abandon it in compliance with the will of the majority of those who would have to suffer the consequences. Indeed it is apparent from the lack of endorsement of the proposals, or any recommendation, that there are major concerns, even amongst those trying to push this through. It is now most important, having had a consultation, that this is not seen to be a done deal pushed thorough in spite of the message sent back from it. It is essential, that having been asked, the voice of the West End it is not ignored, that the Mayor and WCC listen to the outcome of the consultation, and pay attention to it. The latest leaflet from Westminster Council, signed off personally by the Leader and the Deputy Leader, contains some surprising announcements. Westminster Council, we are told: “initially supported the Mayor’s proposal to consult on the proposed pedestrianisation of Oxford Street West…”. We think it went a little further than that. 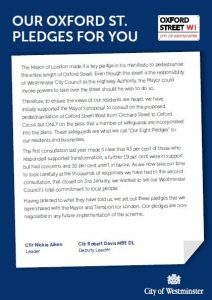 Only last November we were presented with a major leafleting campaign and a JOINT consultation document on “our proposals to transform Oxford Street”, signed on behalf of Westminster Council, the Mayor, and TfL. So now, apparently, only the consultation was supported by Westminster, not the proposed closure to traffic, and that only because, although WCC have ownership of Oxford Street; “…the Mayor could invoke powers to take over the street should he wish to do so”. This hardly sounds like the most solid foundation on which to embark on one of the biggest road projects ever undertaken by WCC; a joint consultation that was apparently only joint because the Mayor was holding a gun to Westminster’s municipal head, threatening to take over the Street if WCC did not toe the line. Well, it is unfortunate that we could not have been told this prior to the consultation — it could have put a rather diﬀerent perspective on things. Well, at least Westminster have finally got the message that there is a great deal wrong with this scheme, joint or not. But the problem now is that most of the “Pledges” are not within Westminster’s power to enforce and, on past performance, the Council will be unable to honour the few that are. 1 We will ensure pollution levels will reduce across the district. As well as initiatives such as the ultra-low emission zone for central London only two bus routes using the greenest vehicles will run through the district, a reduction of almost 100 buses an hour running at peak times. We are monitoring air quality at 100 sites across the West End. WE SAY: UNWORKABLE – Bus numbers can, and are being reduced without closing Oxford Street. How 18 buses per hour running through the adjacent roads and approximately 40 buses per hour running to redirected stands, 24 hours a day, plus many hundreds of additional taxis, lorries and vans per hour will reduce pollution levels is not explained. As for the ULEZ-WCC have precisely no say over how this is operated. Equally it has no control on TfL deciding later on it needs to push more buses through the area, once it finds that 2 extra routes are inadequate. We will carefully design the scheme to avoid creating congestion elsewhere. TFL is in- vesting in advance traffic signal technology to allow them to better manage traffic de- pending on different conditions at any given time and we are working to improve road user information so people can make informed journey choices before they travel. WE SAY: UNWORKABLE – WCC is unable to carefully design anything to avoid congestion, only TfL can do this; and even they really only have control over the buses. The only way TfL can control the rest of the traﬃc is to jam it up somewhere else using its “advanced traﬃc signal tech- nology,” i.e. impose large numbers of slow moving queues on the alternative roads and an inevitable increase in congestion and rat running along the rest. Uniform officers will have the powers they need for effective enforcement to tackle unlicensed or antisocial activity both day and night security including antiterrorism measures will be well-designed and proportionate and keep people safer. WE SAY: DOUBTFUL – Just look at the evidence we have of Westminster’s enforcement abilities to date; it is an abject list of failures: Leicester Square; Trafalgar Square North, free-for-alls for amplified buskers and all forms of illegal street activity; Pedicabs, 10 years of totally ineﬀectual tough talk and no action mean that these third world rickshaws continue to blight our streets; Shisha Smoking joints, unlicensed, noisy, smelly, disturbing residents late into the night; professional begging gangs — all ply their trades openly and unhindered. WCC’s eﬀective management is ineﬀective, and anyway they have no money to manage anything that does not bring them in revenue, e.g., parking. The new Elizabeth line will be step free and some new bus stops will be situated within one block of any traffic free section of Oxford Street and as close as possible to any pedestrianised area. We will also be looking at a new local mobility scheme along Oxford Street to further boost accessibility. Taxis will be able to drop off and collect passengers at the rear of some stores and on each of the side roads. WE SAY: UNWORKABLE – The tube is not an option for many, for reasons of health, mobility, or cost. The Elizabeth Line may be step free, but the chances are the station at the other end of the route won’t be, so where does that leave accessibility? Bus stops as close as possible, in most cases, means 200-300 metres away. Moreover, most will need to change buses at least once even to get that close. The dismembering of the bus service will also badly aﬀect many shop workers, and the army of night workers who rely on an eﬀective night-time bus network, when the tube is closed. And once in Oxford Street, there will be no choice for all but to walk. The majority cannot aﬀord taxis, and those that can will want to go somewhere less polluted and easier to get to. Recent surveys have shown that there are very few shops being serviced from the front via Oxford Street. Our plan is that the maximum distance to a loading bay will be no more than 50 metres. We will use all our enforcement powers to make sure delivery rules will not be flouted. WE SAY: UNWORKABLE – Our recent surveys have in fact shown that approximately 45% of shops have no option but to be serviced from Oxford Street; even TfL put this figure at 35%. The 50 metre distance to a loading bay is ridiculous, that wouldn’t even get to the junction of the nearest side street from most shops, never mind the nearest bay. It will be a disaster for all but the major stores with rear and side loading bays, particularly if WCC make it even worse by then restricting loading on the side streets, the only place they will have left. Yet if they do not, residents’ lives will be made a misery with the noise of revving lorries and countless metal loading trollies being wheeled to and from the shops. Given WCC’s record on enforcement, this is anyway the most likely outcome. Closing Oxford Street will result in massive disruption either way. Buses and taxes will be some of the quietest available so that noise levels throughout the area will largely stay unchanged or decrease for the most part with current plans. We will be monitoring noise across the district making all data available and develop mitigation measures including changing the scheme should that be required. WE SAY: IMPOSSIBLE – Westminster has no grounds for making this assertion. TfL have not even done any traﬃc modelling to assess the consequences of closure at night and WCC have failed to address the question of why Oxford Street should be closed overnight at all, given the disproportionate amount of disruption which would be caused to residents and businesses. It will guarantee that the 500 vehicles an hour that presently use Oxford Street through the night will be forced to find their way through residential streets. The quietest available buses are by no means quiet enough, the taxis will be the same taxis; and they are not quiet, particularly at night, when there is a drop in ambient noise levels. If WCC really think that running all these extra buses, taxis, lorries and vans through our streets will not dramatically increase noise levels they should spend less time with the TfL modellers and get out a bit more. In addition, passengers will be waiting for buses in residential streets, instead of on Oxford Street itself, bringing with them noise and anti-social behaviour. We are developing proposals for a high-quality East-West cycle route to the north of Oxford Street. This network would compliment new facilities coming to the area. WE SAY: UNWORKABLE – Cyclists are to be banned from Oxford Street with the rest of the traﬃc, turning the adjacent streets into noisy, polluted, congested, servicing points for Oxford Street. WCC realises that even they cannot put cycle routes down them as well. Previous attempts to find an East-West cycle route have failed because the streets of Marylebone and Fitzrovia are unsuitable. So any cycle route that is eventually designated, will be nowhere near where the cyclists actually want to be; and given all the other constraints, it is extremely unlikely to be “high quality”. 8 We will ensure resident parking bays will be protected. Our plan is that there will be no impact on the amount of resident, disabled and motorcycle parking currently available. 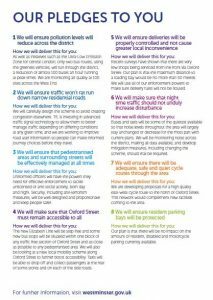 WE SAY: POSSIBLE – Finally, at point 8 we reach something that Westminster Council actually has within its power to promise. But with the huge pressure on all other forms of kerbside use that closure will put on our side roads, even that will be a herculean task to honour. Further they need to go beyond simply protecting this parking, it would need to be properly enforced, and the likelihood of that is very low. Please take just one minute to send a message to the Mayor of London, TfL and Westminster Council that removing public transport & cyclists from Oxford Street results in shifting pollution, congestion and accidents is Not the answer for the West End! CLOSURE OF OXFORD STREET – THE WEST END DOES NOT WANT IT! 66% – of Local Residents opposed/concerned – Why are they being ignored? 76% – of Businesses opposed/concerned – Why are they being ignored? 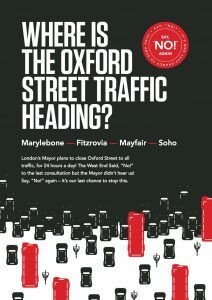 The Mayor plans to close Oxford Street to ALL traffic. For 24 hours a day. He has also stressed that this should only be done if there is no detriment to surrounding residential areas. Despite the results of the first consultation, this gradual development has now turned into a headlong rush to pedestrianise the street all day, every day, with no solutions to the damage threatening residents and businesses or to the myriad accessibility issues. Elsewhere, the world’s major cities give attention to traffic calming and pollution reduction in their residential areas, directing traffic to the major commercial roads. Even here in London, the “Mini-Holland” schemes to be found in outer London do the same. But with Oxford Street, Mayor Sadiq Khan wants to do the opposite: remove the traffic from one of central London’s few major east-west routes and push all the traffic, the congestion and pollution into the surrounding residential areas. Areas that already have major problems with too many vehicles and pollution levels way above EU recommended safe levels. What sort of reality does the Mayor live in where he thinks that all this traffic should be taken out of an almost 100 per cent commercial area and pushed through its surrounding residential streets? Shifting congestion, pollution and road safety issues rather than tackling them is unacceptable. The scheme also creates a public realm management challenge at a time when there is no budget to tackle enforcement issues of antisocial behaviour. Westminster Council currently struggle to manage the existing public realm in Leicester Square and Trafalgar Square, Oxford Street would a free for all, for buskers, illegal street traders and other forms of antisocial behaviour. And why hasn’t he listened to the message that came through loud and clear from residents and small businesses, schools, hospitals and many of the area’s stakeholders from the first consultation? The majority of those that live and have businesses in the West End are against this scheme* – if this had been a referendum it would have been thrown out then. Instead it is being pushed through to the detriment of the wider West End. The people who know the area, who know the consequences of these hasty and ill thought out proposals, don’t want it. That “transformation” of Oxford Street can only be achieved by full closure. That pollution in Oxford Street can only be solved by full closure. That pedestrianisation will increase the footfall and the retail take. That Crossrail will result in huge extra numbers in Oxford Street.***. That users of Oxford Street, particularly those older and disabled, those that work there, indeed those that shop there, do not want to be able to get a bus there. That traffic, once Oxford Street is closed, will simply evaporate and not run though the streets nearby. That businesses actually want it, whereas many will have huge problems in getting goods to their stores. That the huge amount of additional enforcement that will be vital in the wake of pedestrianisation, particularity through the night, will actually happen. That residents will not be affected by all the shops and businesses having to be serviced from the small streets surrounding Oxford Street. That these proposals can be pushed through without significantly affecting other existing and approved major road alterations including the Baker Street Two Way Project and, the Tottenham Court Road Scheme, which already will be removing significant road capacity. All other traffic will be displaced through surrounding local neighbourhoods of Marylebone, Fitzrovia, Mayfair and Soho. That includes: vans, lorries, taxis and pedicabs. After 7.00pm it also includes not only all the taxis but all the private vehicles and non black cab traffic that fill Oxford Street through the night. It means that all Oxford Street shops, stores and offices will need to be supplied and serviced through the surrounding residential streets. And we are told that this will improve the wider area! During the day Oxford Street will be open to amplified buskers, traders, pavement artists, clowns, jugglers and beggars; such as we already see in other pedestrianised areas in Leicester Square and Trafalgar Square. Westminster Council has neither the funding nor the will to control those relatively small areas. What chance is there that they will be able to police a mile of pedestrianised road? The only “transformation” will be to a higher level of tackiness than can be presently imagined. The scheme, as has been acknowledged, will increase the likelihood of terrorist hostile vehicle attacks, as recently seen here and in other cities. The proposed way to stop this is to have vehicle safety barriers at all junctions crossing Oxford Street, unsightly, ungainly and of course a major problem for any vehicle access, from emergency services to road cleaning. At night things will be even worse with an extremely long, empty un-patrolled street open to roaming gangs and the sort of anti-social and illegal behaviour that the police and the council find difficult to control even under the present conditions of easy access. Finally, not only do these proposals threaten to severely damage and undermine some of London’s finest historic conservation areas, and to do so without any good reason, but they are extremely expensive. TfL estimate they will spend in the region of £60 million to implement full closure, with an ongoing servicing obligation of many million pounds a year. Transformation of Oxford Street? More like mutilation of the areas surrounding Oxford Street. Reduce the pollution in Oxford Street by reducing buses and emissions NOT by pushing it all through the surrounding areas. Better Oxford Street is a not for profit residents and business group formed and supported by The Marylebone Association, the Fitzrovia Neighbourhood Association, Charlotte Street Association, Mayfair Residents Group, Residents’ Society of Mayfair and St James’s, all members of the West End Community Network. The area covered has a total residential population of approximately 42,000 and circa 470,000 business employees. *48 per cent of local residents are unequivocally against, 18% have concerns only 29 per cent support the proposals put forward by Mayor Sadiq Khan and pushed for by campaign group Living Streets. Residents say they are strongly against buses being diverted along parallel roads and taxi ranks being placed in side streets. Businesses are even more opposed to the scheme: 60 percent are unequivocally against, a further 16 percent with concerns, and only 19 percent are fully in favour of the scheme. This figure puts most businesses at odds with the New West End Company which is in favour of the proposal albeit with some reservations. Nearly 50 percent of all respondents either oppose or have concerns about the proposals and only 43 percent support the transformation of Oxford Street and are comfortable with the changes that would be necessary to make it possible, according to the consultation report. So only 29% of local residents and 19% of businesses owners actually supported “transformation” without reservations. *** In 2007 160 million passengers used the four Oxford Street tube stations. In 2015 161 million passengers used the four Oxford Street tube stations. A 0.1% rise in passengers meanwhile London’s population grew 13% over the same period. London growth does not translate into increased journeys into Oxford Street. ****London Buses propose removing most existing west/east bus routes to Marble Arch or Oxford Circus. 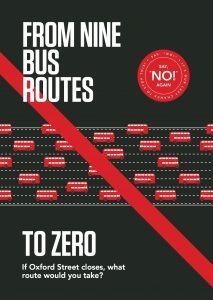 The existing bus route network that runs along Oxford Street has 8 routes at 75 buses per hour. This will be slashed to 2 routes, the 139 and 390 which will be diverted along Wigmore Street at 18 buses per hour day time and night services of 8 buses per hour. This will curtail a well established bus route network, with easy access/interchange- for the many users who cannot use the tube network. The 2 diverted routes are not easily accessible to Oxford Street, and make it hard to get to interchanges between bus routes – at Marble Arch/Park Lane. This will disadvantage many, but again particularly those vulnerable passengers, the elderly and disabled who will no longer find these routes viable.